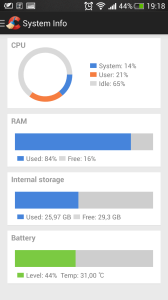 Piriform CCleaner is for most the best maintenance software out there to clean registry, temporary files on your computer, and now lands on Android beta enversión also try to be the best cleaner application Google Play. Beta CCleaner also offers an application manager in addition to seeing the applications installed can uninstall several hit just by checking that we no longer have on our Android devices. Improved check box and UI responsiveness. Improved Call Log and SMS item selection. Jedná se o beta verzi určenou na testování. 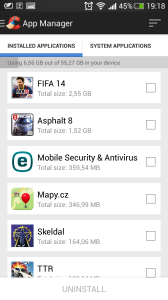 Aplikace není běžně dostupná na Google Play, proto je odkaz nefunkční. CCleaner zatím umí čistit historii prohlížečů, mazat cache paměť, SMS nebo informace o posledních hovorech. Dále nabízí možnost hromadného odinstalování aplikací nebo sledování využití procesoru v reálném čase. Kromě procesoru můžete taktéž sledovat RAM nebo zbývající kapacitu baterie. Remove junk, reclaim space, monitor your system and browse safely. Become the Master of your own device with the ultimate cleaning app for your Android! - Added Google Play Search History cleaning. - Added APK File cleaning. - Added Settings to define items for analysis. - Added Bluetooth Folder cleaning. - Improved Cache analysis and cleaning. - Added Portuguese (BR), Chinese (Simplified, Traditional), Vietnamese, Slovak and Croatian translations. Note: This app has NO advertisements. - Added Custom Files and Folders cleaning. - Improved Empty Folder scanning algorithm. - Added locked SMS detection. - Optimized WhatsApp and Advertising Cache cleaning. - New Scheduled cleaning (CCleaner Pro for Android only). Note: PRO features are Unlocked!! Oproti free verzi obsahuje navíc plánovač. - Improved analysis and cleaning performance. - Added ability to create multiple cleaning schedules (CCleaner Pro for Android only). - Optimized App Manager scanning algorithm. - Improved SD Card detection. - Optimized scheduled cleaning (CCleaner Pro for Android only). - Improved Storage Analyzer performance. - Improved scheduled cleaning (CCleaner Pro for Android only).